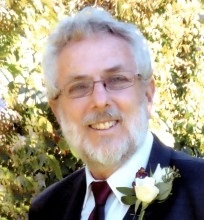 Ralph Gordon Milton, of Stratford, passed away peacefully with his loving family by his side at St. Mary’s General Hospital, Kitchener, on March 29, 2019. Sixty-four years young, he was born in Moose Jaw, Saskatchewan, to Ross and June (nee Thornback) Milton. He grew up in an air force family that lived in Saskatchewan, Ontario, Quebec and Florida before finally settling in New Hamburg. He attended the University of Waterloo where he majored in French and minored in German and Latin. His love for French led him to meet the love of his life on a French exchange in Quebec. A devoted scholar himself, he completed his Masters of Education and numerous other courses. As a teacher, consultant and principal, he touched the lives of countless students and took great interest in following their successes. He is the beloved husband of Anne (Stewart), the devoted father of Paul (Katie), Marc (Alejandra), Claire (Corey) and the adoring grandfather of Melanie and Madeleine. He will be missed by his sisters Gail (Gordon) English and Judy Maddess; sisters-in-law Bonnie Fortune and Joan Stewart; brother-in-law David Beccario; and many nieces, nephews and dear friends. He is predeceased by his parents, parents-in-law Ken and Clarissa Stewart, brothers-in-law Jim Maddess, Mac Stewart, Rick Fortune, and sister-in-law Amy Beccario. Dad loved educating, helping, and making others smile. He enjoyed many years of retirement, driving his Mustang, travelling with Mom, and spending unlimited time with his family. Visitation will be at the W.G. Young Funeral Home, 430 Huron Street, Stratford on Wednesday, April 3, from 2-4 and 7-9 p.m. The funeral service will be held at Parkview United Church, 470 Ontario Street, Stratford on Thursday, April 4, at 11 a.m. We will celebrate his life at the church following interment at Avondale Cemetery. Memorial donations may be made to the Heart and Stroke Foundation, St. Mary’s General Hospital (Kitchener) – Critical Care Unit, or Parkview United Church, through the funeral home.